Chem-Dry technicians stay on the cutting edge of the carpet cleaning industry by participating in annual training and receiving required certification. This way you can be confident that your Chem-Dry carpet and upholstery cleaner is experienced in servicing a variety of types of fabric and that they will provide the appropriate care for even the finest carpets, rugs and upholstery. 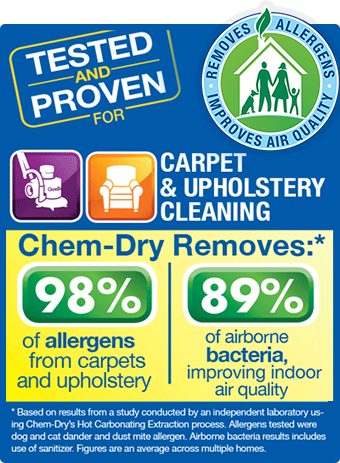 Chem-Dry® technicians that are 5-Star Certified receive the title of “Master Technician.” The Master Technician program ensures that technicians are trained in the latest carpet and upholstery cleaning technology for expert cleaning, stain removal, pet urine odor removal, customer service, trustworthiness, and more. For Chem-Dry carpet cleaners, the Master Technician certification represents the highest level of carpet cleaning skills and services.